An article published in the Wall Street Journal today, headlined the “Price Tag of Bernie Sanders Proposals: $18 Trillion,” seems intended to induce what I might call “single payer sticker shock.” After all, the article states, $18 trillion not only “alarms conservatives,” but also “gives even many Democrats pause.” $15 of that $18 trillion is attributed to Sanders’ proposed single-payer health care reform. It sounds like a forbiddingly high number. But is it a fair number? A story by David Dayen at The Intercept (“Wall Street Journal’s Scary Sanders Price Tag Ignores Health Savings) and a post by Matt Yglesias at Vox (“Bernie Sanders’ $18 trillion in proposed spending is more affordable than it sounds”) help put this number in context, but I think there are couple more things to be said about it. As Dayen notes, the article draws from a study published by Gerald Friedman, an economist at the University of Massachusetts at Amherst, to compute the $15 trillion figure. Friedman wrote the study in 2013 in order to estimate how HR 676 – the single-payer bill sponsored by Congressman John Conyers – might be financed. The mix of taxes Friedman suggests is one potential approach to paying for single-payer; others are possible. In any event, since the WSJ article relies on Friedman’s estimate, it’s worth turning to his report and asking: how much would single-payer cost? There are two ways to answer this question. Thus, according to Friedman’s analysis, the cost of expanding health coverage to everyone in America (i.e. eliminating uninsurance together with most out-of-pocket health care costs) along with various associated costs (e.g. reimbursing owners of for-profit health facilities and assisting newly unemployed insurance workers) would cost $394 billion annually ($51 billion of that would be for transitional costs, so would apply to the first year only). So should we argue that single-payer “costs” $394 billion a year? No, we shouldn’t. 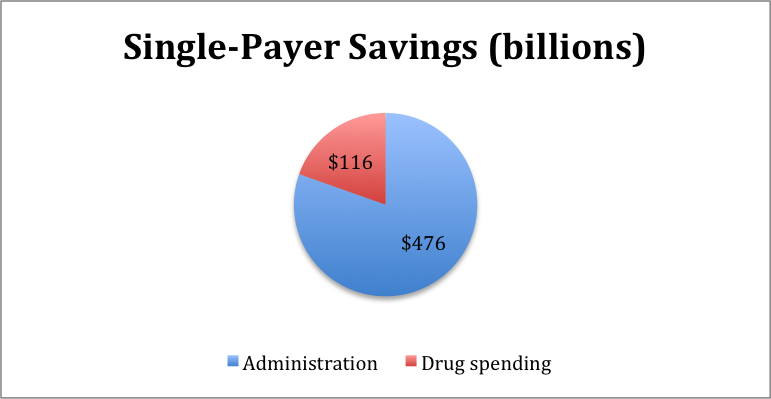 Table 3, “Savings on provider administrative overhead and pharmaceutical costs,” details the various savings associated with a single-payer system. Direct governmental negotiation with pharmaceutical companies over drug prices would result in $115.9 billion savings annually. Reduced administrative expenditures (something I recently blogged about), would, according to Friedman’s numbers, save $476 billion a year. Now, as Dayen argues, this makes sense: “The entire point of a single-payer health care plan, aside from covering everyone in the country,” he writes, “is to minimize costs, by reducing administrative bureaucracy, the profit motive and middlemen.” Exactly. But if savings > costs, where does the $15 trillion figure come from? 2) Payments made for insurance premiums for those not covered by their employer. While payroll taxes are only one way to finance single-payer (and, as the 2003 PNHP proposal notes, progressive taxation would actually be fairer), the overall principle holds: replacing current health care expenditures with taxes would be relatively unobtrusive for most of us. And in return for what is essentially a spending swap, we would have universal first-dollar health care for everyone in the nation. That seems, to me, to be a small price to pay. Note: Edited for unfortunate name misspellings … Apologies! Also, my initial figures for administrative (and total savings) were incorrect in the text, though they were correct in the pie chart; they have now been corrected. Finally, I’ve now clarified that of Friedman’s $394 billion per year in costs for health system improvement under single-payer, $51 billion would be for transitional costs which would apply for the first year only. Note 2: How much would those payments be? Although the $15 trillion figure is sourced in the WSJ article to Friedman’s study, the study that I linked to doesn’t mention that number. I’m assuming the figure combines the assumptions of the study with projected national health expenditures over the next ten years (figures noted by both Dayen and Yglesias), which are available from CMS here (NHE Projections 2014-2024, Table 3 “National Health Expenditures By Source of Funds”). Summing the projected national health expenditures for the years 2014 – 2023 gives us $4.14 trillion in projected out-of-pocket payments and $13.16 trillion for private health insurance. Those sources of payment would need to be replaced with public funding. Doug Henwood also pointed to this data, and made a similar overall point, at LBO. Note 3: I’ve noticed that Gerald Friedman, the author of the study cited by the WSJ, has weighed in on the use of his analysis at the Huffington Post, available here. He includes his 10-year projections, and confirms that approximately $15 trillion in new federal spending would be required under HR 676. However, “…by spending these vast sums,” he writes, “we would, as a country, save nearly $5 trillion over ten years in reduced administrative waste, lower pharmaceutical and device prices, and by lowering the rate of medical inflation.” The bottom line couldn’t be clearer. So scary those numbers…..thanks for the explanation! Makes more sense!